Szymanski, Erika. “Review—Experts: The Knowledge and Power of Expertise.” Social Epistemology Review and Reply Collective 4, no. 5 (2015): 33-36. 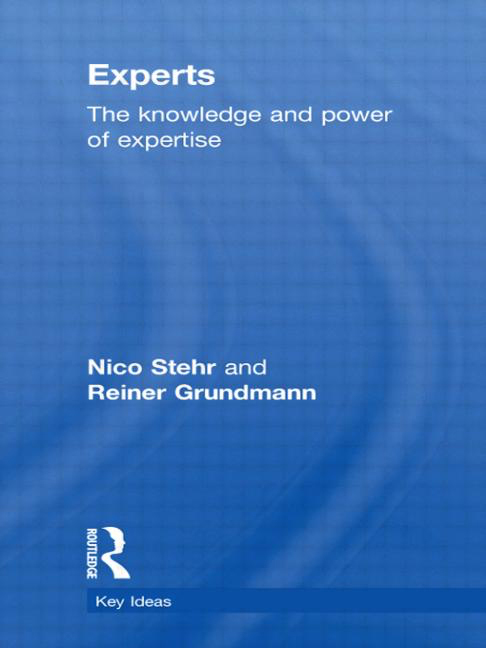 If you are looking for a provocative argument about what being an expert means in contemporary information-driven cultures, I would offer that your time is better spent somewhere other than Stehr and Grundmann’s Experts: The Knowledge and Power of Expertise (Routledge 2011). The book reads more as a conservative intellectual history situating the “expert” in knowledge societies than a new position statement. That history is useful: they define and contextualize the expert as contemporary case studies often fail to do; they raise many questions about the role of experts as a general group that usually remain invisible in those studies. Unanswered as often as not, these questions might serve as a productive repository for future debate. Be forewarned, however, that you may find little that feels genuinely new as a reward for wading through Stehr and Grundmann’s sometimes-dense prose. The trim volume is part of Routledge’s “Key Ideas” series that “covers the main concepts, issues, debates, and controversies in sociology and the social sciences.” Stehr and Grundmann discuss experts as both a concept and a set of issues. Where they locate the issues, however, seems out of place to me, coming as I do from the direction of science communication and rhetoric rather than sociology. Through five chapters, they establish that experts by definition could be imagined as above and outside politics. The final chapter establishes that experts are political actors anyway. Following many scholars in science and technology studies (see, for example, Wynne 2001 or Suryanarayanan and Kleinman 2012), that would have seemed a well-established point. Chapter one lays out a definition of expertise more limited than that used (albeit too often tacitly) elsewhere in science and technology studies. Whether the reader sympathizes with this definition frames the utility of what follows. “Expert” is treated as synonymous with “advisor” or “consultant” and defined as “those who deal with transferring and applying knowledge;” transferring is important and, per the chapters that follow, applying alone appears to be insufficient. This definition suggests that an individual is only an expert when called upon to perform that expertise by sharing knowledge for the benefit of someone else’s knowledge. It would be inappropriate for me to call a winemaker an expert at winemaking after drinking her wine and judging its quality. To earn the title, she would need to serve as a source of winemaking knowledge, if not for me, then for some other satisfied and trusting client. Even though Stehr and Grundmann expressly allow that experts might be, for example, farmers or travel agents, their definition and the rest of the book seems to apply the term only to those who deal principally and professionally with abstract knowledge qua abstract knowledge, even if expert knowledge includes a tacit dimension. Experts are, here, a professional group trading in knowledge, social knowledge brokers who add personal or tacit knowledge to objectivized knowledge in a way that creates the potential for social action and that can be shared with someone else. The constraints of that definition allow the authors to discuss experts as a group with a political role and effects on the knowledge economy. The same constraints limit application to such questions of boundaries, negotiations, and applications of expertise as occupy much current STS work. Chapter 2 establishes why “expert” is not synonymous with “knowledge worker” or those who work in knowledge-based professions, the traditional professions (physicians, lawyers, etc. ), or “intellectual.” In so doing, the authors touch on the ballooning number of knowledge workers in the 20th century, professional independence or lack of independence from political and economic authorities, and the difference between being a modern and a post-modern academic (the former making active and “authoritative” knowledge statements, contrasted with the latter re-interpreting existing statements in allochthonous settings). The authors also echo the argument that increases in the demand for expert knowledge are a consequence of the increased availability of experts—not the reason why more experts exist—and that the explosion of experts is itself a product of increased education and expectations of a longer working career. The main thrust of the argument is that experts do not constitute a new “class” with characteristic claims to power. Expertise is too diffuse a concept; experts occupy too many different social roles. Saying so points again toward the tension between Stehr and Grundmann’s position and conversations about multiple forms and locations of knowledge. The subtext is that “expert” is a professional role, excluding forms of expertise dealing with the various other roles people play: citizens (Whatmore and Landström, 2011), indigenous residents (de Laet 2002; Brandt 2014), patients (Pols 2014), activists (Epstein 1995), hobbyists (Suryanarayanan and Kleinman 2012), or amateur enthusiasts (Perlman, 2004), for example. If many, even most people hold some form of expertise, that experts are diffuse seems a point hardly worth making. The idea that experts professionally conduct value-added knowledge transactions, plus the epistemic weight scientific knowledge commands, could lead to slippage between “expert” and “scientist.” Chapter 3 establishes in more detail that the two are not synonymous. Experts are defined not by making new knowledge but by “passing on” knowledge in a way that makes it easier to understand and use. In so doing they control how knowledge is contextualized, giving them some kind of power. That power is limited, however, because there is no direct and obvious route between knowledge and how it is applied, and because, despite their proliferation, experts have been unable to conclusively solve all problems. Being an expert consequently does not mean having any particular form of social power. Chapter 4 extends that claim into a question about which experts are the most expert or have the best knowledge, using the recent economic and climate change crises to exemplify that being an expert does not necessarily mean always being right, effective, or having a social conscience. Having transitioned from experts to scientific experts specifically, Chapter 5 deals with the “crisis of scientific expertise,” asking what role scientific experts play in a future in which the business of knowledge, like the business of anything else, is unlikely to simply grow forever. Stehr and Grundmann muse over how society could be shaped by what more flippant authors might have called “the expert bubble,” hinting at potential future worlds in which experts facilitate informed democracies, or systematically withhold knowledge access from an increasing population of “illiterates” (their word, not mine), or continue to expand as the knowledge ecosystem becomes more confusing and non-experts increasingly need expert advice to navigate it. The “crisis” looks toward these futures in the light of present public misgivings: what future role can or should scientific experts have in political decision-making when their imagined infallibility has been laid bare and they can no longer command unquestioning trust? As with so many of the questions raised in the book, Stehr and Grundmann leave these unanswered. I wonder how this final discussion would have changed were expertise treated as a sometimes-role performed by many different actors in different spaces. Will communication networks and information management systems continually improve so as to facilitate endless sharing of multiple expertises as and when needed? Segment to develop ever more codified strata of expertise? Provoke us into an era in which we again redefine our highest knowledge authority? The book, once again, becomes useful as a source of interesting unanswered questions. The three final pages, too, could provide a checklist for exploring expertise in case studies of science-in-society: expertise is held by individuals; expertise mediates knowledge transfers; expertise is varied and promises no specific social power; whose knowledge is best or most expert depends on the changing favors or fashions of society. If you begin there, however, the central motion of the book is uncontroversial. Brandt, Marisa. “Zapatista Corn: A Case Study in Biocultural Innovation.” Social Studies of Science 44, no. 6 (2014): 874-900.
de Laet, Marianne. “Introduction: Knowledge and Technology Transfer or the Travel of Thoughts and Things.” In Research in Science and Technology Studies, Vol. 13. Edited by Marianne de Laet,1-9. Emerald Group Publishing, 2002. Epstein, Steven. “The Construction of Lay Expertise: AIDS Activism and the Forging of Credibility in the Reform of Clinical Trials.” Science, Technology & Human Values 20, no. 4 (1995): 408-37. Perlman, Marc. “Golden Ears and Meter Readers: The Contest for Epistemic Authority in Audiophilia.” Social Studies of Science 34, no 5 (2004): 783-807. Stehr, Nico and Reiner Grundmann. Experts: The Knowledge and Power of Expertise. London. Routledge, 2011. Suryanarayanan, Sainath and Daniel L. Kleinman. “Be(e)coming Experts: The Controversy Over Insecticides in the Honey Bee Colony Collapse Disorder.” Social Studies of Science 43, no. 2 (2012): 215-240. Whatmore, Sarah J and C. Catharina Landström. “Flood Apprentices: An Exercise in Making Things Public.” Economy and Society 40, no. 4 (2011): 582-610. Wynne, Brian. “Creating Public Alienation: Expert Cultures of Risk and Ethics on GMOs.” Science as Culture 10, no. 4 (2001): 445-481. Wynne, Brian. “Misunderstood Misunderstanding: Social Identities and Public Uptake of Science.” Public Understanding of Science 1, no. 3 (1992): 281-304.